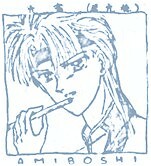 Special Power: Able to control life energy, 'qi', by using his flute. Character: Amiboshi is a stable and careful person. He is sometimes very energetic and sensitive. He is a young man with a kind heart, and always plan for the future. His reason to live is to protect his brother, Suboshi. Due to this fact, he feels very painful while struggling between the Suzakus and the Seiryuus.